I met the most interesting person this weekend... via eBay. That's right - eBay. I was selling all my "West Wing" DVD sets and she was buying. Like me, someone recommended the show and she got hooked. Once addicted to good television you've got to have the next fix of the next season if it's available. She found me and since she lived in Scottsdale we met at a Barnes and Noble and completed the transaction. She got to save $15 in shipping costs and I got to meet a fabulous person who is into politics and just happens to be... a democrat. She was articulate and very intelligent regarding geo-politics, Washington politics and even what is happening locally in the Scottsdale, Arizona area. It was the nicest conversation I've had in some time, and definately the nicest conversation I've ever had with a democrat. One of the topics I wanted to bring up to her was John F. Kennedy. I find it intersting that many of Mr. Kennedy's political positions are nothing like those of the democrats holding office today. President Kennedy is a democrat that I could support politically. Perhaps I wouldn't vote for him, but once in office, I could support him. My new friend and I talked briefly of Arlington Cemetery. She lived in the Washington DC area and covered politics for the BBC. She mentioned she had friends buried there... having walked the grounds of Arlington for hours I know how sacred a place it is for those who visit. One of my favorite spots is the grave of JFK. 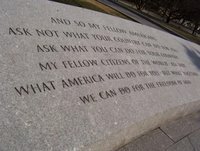 Opposite his grave and facing the Lincoln Memorial are a series of panels that quote President Kennedy. They are faded now and hard to read (this picture makes them clearer than I've seen them in person), but never the less relevant. They are standards this country should be shouting to the world and living up to every day. When you read these panels they sound like they were thought of and endorsed by a man who had an agenda to bring freedom to every American and to every human being. In deed, the quote on the panel above not only speaks of America and its citizens, but of the world, and what will other nations do to help America bring freedom to the citizens of planet earth. What side of the conflict in Iraq would JFK have been on? It sounds like he would have been fighting for their freedom instead of fighting President Bush. Now let me be clear, I'm not flip flopping on Iraq. The US Military needs to cut back and turn things over the the people in Iraq, but how easier would a US pullback be if the entire free world was backing the new Iraqi Government? Could this conflict be over by now if the world would have backed the United States in it's move to free the people of Iraq of a murdering dictator? I believe the answer is yes. Often we here the argument that "hey, we can't bring freedom to every country... what about North Korea?" Blah blah blah. One at a time people - one at a time. I didn't get an opportunity to talk about this with my new found friend. However, I believe we can have constructive dialogue between political ideologies and find the common ground. We must discover the common ground in this country. Our politics have become too hateful and too demonic. We should demand that our party leaders start speaking like statesmen (and women) and stop trying to get the right sound bite covered by the news media. We must remove the fringe groups - on both sides - from having too much influence in our debates. Their extreme but loud views (living on the edges of reason), leaves the quiet majority in the middle. We must find the common ground and reason together. I heard reason today... at Barnes and Noble. 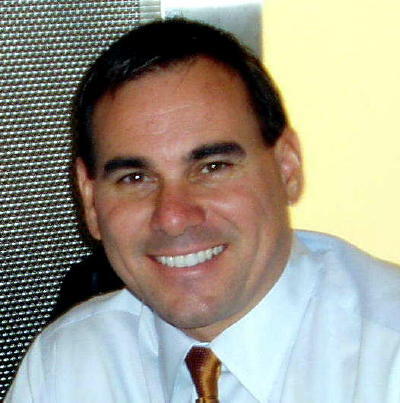 This is Scott McClellan. I didn't know his background before I wrote this entry... but I've seen too many White House press briefings to believe he was the best man that President Bush could find to represent his White House. Just as Helen Thomas shouldn't be reporting the news from the White House, Mr. McClellan shouldn't be dishing it out. The face of the White House is too important. THE BEST QUALIFIED individual should be doing the job. Sounds like he's from Texas... hmmm. I wonder if his parents know the Bush family? Mr. McClellan could be a genius and that wouldn't matter. What matters is how he looks and how he sounds when representing the President. I think President Bush can do better. 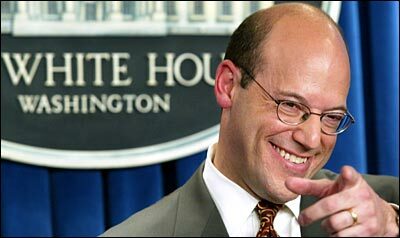 Do you remember Ari Fleischer? Why did he leave and where did he go? I liked Ari - he was a press secretary cut out of the mold of say... CJ Craig. I believe the press secretary is just too visible to not have someone who is 6'3" and slim. Tan would be good too... most importantly, they need to be one of the sharpest people in the room. They need to be witty and able to go head to head with reporters who sometimes have an agenda and at other times just "get stuck on stupid." They need to speak well and command respect. They need to be in charge. Is Scott in charge? President Bush has a few opportunities to communicate his strategy for the remainder of his presidency. Every hint of what that strategy is, will go through Scott McClellan, and the message is going to be diluted... McClellan is a mistake.